NOTES: Smart kit, but no worries about trank links on this one. Originally intended as an anti-aircraft weapon, the German 8.8cm cannon (commonly called an ‘eighty-eight’) turned out to be a formidable antitank weapon too. The 8.8cm gun appeared in the guise of the FlaK 18 and FlaK 36/37. An even more potent version of this famous gun was the PaK 43, which had an L/71 caliber. This same gun was fitted in the Jagdpanther, Hornisse/Nashorn and Ferdinand/Elefant tank destroyers. A mounted version of the same weapon was fitted in the Kingtiger, where it was known as the KwK 43. The weapon was enormous, measuring 6.4m long, and the ammunition used an 82.2cm-long casing. 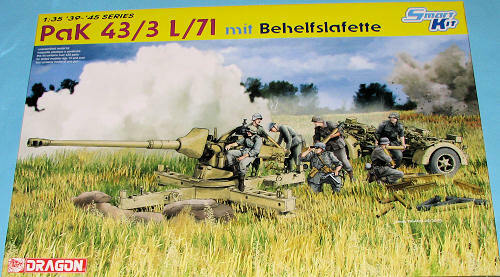 tThe PaK 43/3 L/71, a gun originally destined for insertion in the Jagdpanther tank destroyer was simply added as was to the Behelfslafette (this German term translates as ‘simplified gun mount’) making it useful for static defense as such was the need for anti-tank weapons during the late war period. This weapon offered little in the way of crew protection. The kit has minimal photo-etch, something that I know will appeal to those who do not like to use it, and while it would have been nice to have a metal gun barrel, the plastic one is superbly molded and after paint, I doubt you'd notice the difference. Of course, the kit can be displayed ready for action or in a traveling mode with its gun carriage attached. The instructions show exactly what needs to be done for either option. A small decal sheet is provided for stencils. 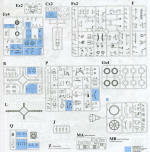 There is no unit info provided and the piece is to be painted overall Panzer Yellow. 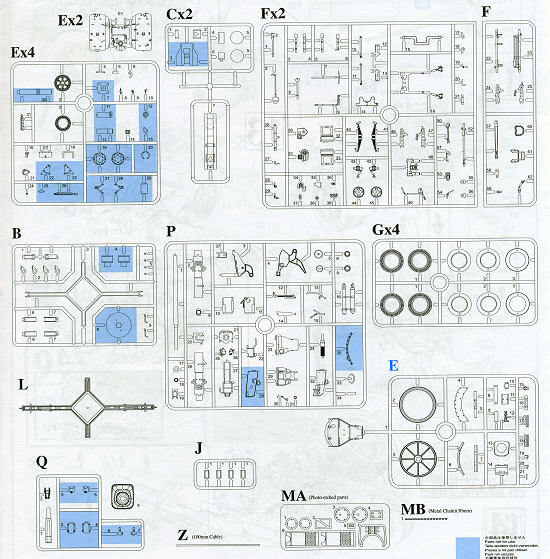 At 420 pieces, it is not one of Dragon's more complex kits, yet provides all the detail that you would want or need in a field piece like this. An excellent choice of subjects for the late war period and one that I know will appeal to many.